Say I set base SDK to 7, what does it mean? It could mean that the app would run on iOS 7. But that's what iOS deployment target is for. Also why do I specify those 3 values in both project and target. It doesn't make sense. Why specify the same thing twice? The base SDK is what you build your app against (i.e. include and library files and frameworks). As you say, it doesn't affect the deployment target, except that base sdk >= deployment target. You specify build settings on 2 levels as each project can have multiple targets and you might not want the same settings for all targets. The project-level settings override the default settings and the target-level settings override the project-level settings. For example I have projects with both OSX and iOS targets and some are ARC and some are MRR. I'd have to have different projects for each if I was unable to specify build settings with the level of granularity that Xcode allows. Good read Hi! I'm #available! So, a modern App might use iOS 9 as the Target SDK, and iOS 7 as the deployment target. This means that you can run on iOS 7, iOS 8 and iOS 9, and that you have available to you any iOS 9 calls when actually running on iOS 9. Base SDK is the SDK you link against. Deployment Target is the minimum required iOS version you application needs to run. You can build an application with SDK 7 that runs under iOS 6. But then you have to take care to not use any function or method that is not available on iOS 6. If you do, your application will crash on iOS 6 as soon as this function is used. Deployment Target specifies the minimum version of iOS that your app supports. 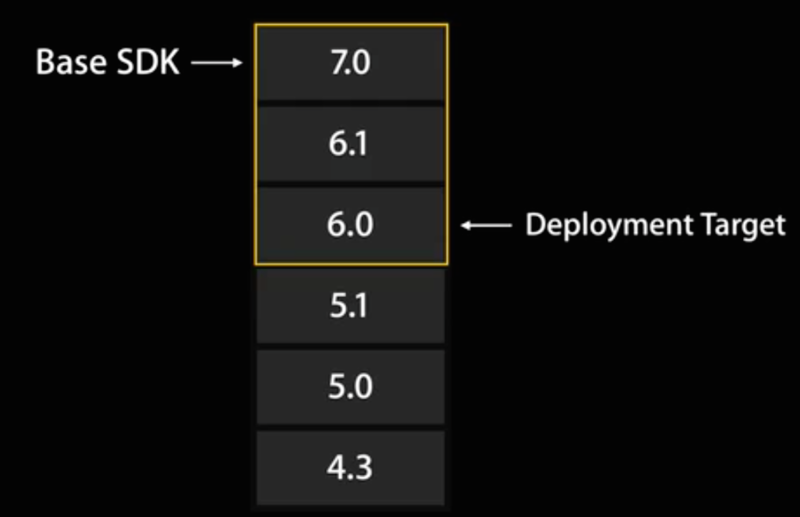 So, your app's Deployment Target should always be set less than or equal to its Base SDK. It should be set to the lowest version on which your code is supposed to run. Not the answer you're looking for? Browse other questions tagged objective-c xcode4.5 or ask your own question. What does deployment target mean? I set the deployment target to iOS8 and App store says “Compatibility: Requires iOS 7.0 or later”. Can I force app to install only in iOS8 only? How do I set a previous base SDK in Xcode 10? How do I build for iOS 4.0 devices with XCode 4 + base SDK 4.3? Xcode Targets, projects and tests? What is the meaning of separate settings for project/target in xcode? XCode deployment target iOS 6 = compatibility to?